So I skipped a few weeks of meal planning. Ahem. It was a disaster for both our waistlines and our budget. We ate out, I cooked very little, and once our A/C broke I lost my momentum to cook in the heat. So this week I’m back to it. If you’ve been wanting to try meal planning, give it a shot! Watch my vlog on Meal Planning, part of my 31 Days of Grocery Savings series. Happy 4th of July! We’ve been eating lots of BBQ and party food all weekend–you, too? 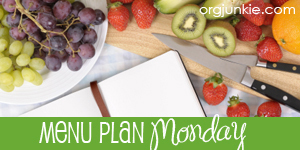 For more meal plans and recipes, head over to the Menu Plan Monday linky at OrgJunkie.